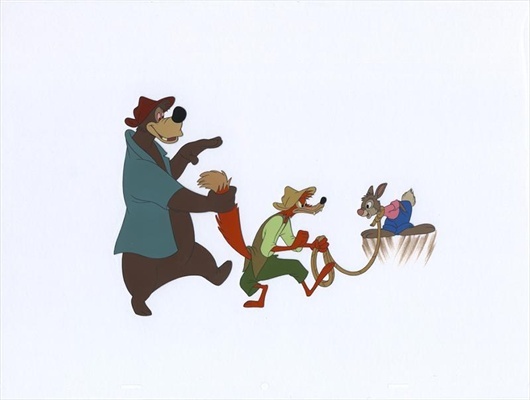 Updated 11/10/2018 This original hand-painted cel of Brer Rabbit, Brer Fox and Brer Bear was created in the Disney ink-and-paint department during production of a limited edition set of 350 cel paintings based on the "Laughing Place" animated segment of Walt Disney's wonderful 1946 animated feature. In 1989 Disney Art Editions released a set of two limited edition cels based on the "Tar Baby" and "Laughing Place" segments of the movie; the cel paintings bore the Disney seal and were numbered. This cel painting was created at Disney at the same time over and above those issued in the official release; it is unnumbered and without seal.